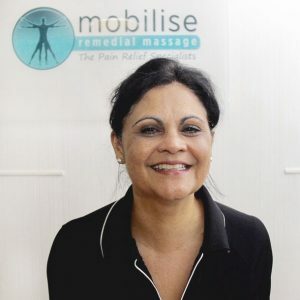 Leslie is an experienced Myotherapist and Remedial Therapist at Mobilise. She holds a Bachelor of Musculoskeletal Therapy, as well as a Diploma in Remedial Massage. Leslie is passionate about helping people to be pain free, and teaching them the skills to stay that way. In our usual tradition, here’s our “interview” with Leslie, so you can get to know her! Tell us about your background in this industry? My love for the industry start back in 2011 when I was introduced to a very gentle technique of applying essential oils to the back, neck and feet. I was blown away by the affect this had on people through the oils and through the nurturing power of touch. I decided that a more formal qualification was necessary to give me the necessary credibility to pursue this as a career and attended a weekend course in Tui Na – a form of Chinese massage; naturally this was way over my head as I didn’t have the necessary foundation in anatomy, physiology or massage techniques required to gain any benefit from the course. However, after chatting with the other participants and after experiencing some benefits from being practised on during the course, I decided that this was definitely the career change I needed and immediately enrolled in the BHSc in Musculoskeletal Therapy at Endeavour college of Natural Health. What do you love about this profession? I absolutely love achieving a positive end result – i.e. being able to improve a client’s condition, relieving the pain or discomfort through restriction they may be experiencing, however not only is the end result satisfying but the thought and assessment process involved in reaching a successful working diagnosis. Addressing certain conditions is not always straight forward but often a process of elimination using various methods of testing and treatment. What types of painful conditions do you enjoy treating? At this point I’m most comfortable treating neck, shoulder and lower back conditions – probably because those are the ones with which I have the most experience. I know that in time, with more experience and professional development I will enjoy treating many more conditions and regions of the body. Do you have any personal philosophies that help you to be a better Myotherapist? Never stop learning. I believe that good assessment methods are essential as this assists in arriving at the most accurate working diagnosis possible. I like to re-evaluate each case after the session in order to ensure that I have arrived at the best possible solution and to be sure that I have not missed something that could be an integral part of the treatment. Wow – tough question. Study took up so much of my time that there was very little left for fun. Having said that, I have a keen interest in photography, I used to play squash and have my scuba-diving licence so would love to pursue any or all of these activities in the near future. I should throw in some other exercise too but all in good time I suppose. Finally, a fun question – if you could invite 3 people from history to have dinner with you, who would they be and why? Hippocrates – because not only did he believe that food is medicine but he also believed in the power of touch as a means of assisting the body to heal itself. There have been several studies over the years in support of this and this is a great article that is a testament to the healing ‘Power of Touch’. And finally Dr Wayne Dyer – spiritual teacher and motivational speaker. Whilst Wayne Dyer has only recently passed, his teachings have influenced me greatly in the areas of spiritual development, my belief and confidence in myself and meditation and mindfulness. It took many years to make the decision to embark on such a drastic career change as I had a tremendous fear of failure and there were times when it would have been so much easier to drop out of uni than to keep going. It is through the example and teachings of the great men mentioned above and others that I had the courage and tenacity to follow through and complete my degree allowing me to be part of an industry that I now love. All the very best for a fulfilling future, Leslie-Ann. She is the most kind and caring person. She has been so dedicated fixing my ailment. Aw thanks Debbie, that’s lovely to hear!